At YouthCare's Orion Center, groups of moms, co-workers, friends and even book clubs come together to make lunches and dinners for young people who need them — and you can help, too. If you’ve been stuck in traffic at the foot of Denny, you’ve seen the lime-green YouthCare Orion Center. Maybe while you’re snarled, trying inch by inch to get on I-5, you’ve wondered what happens there. 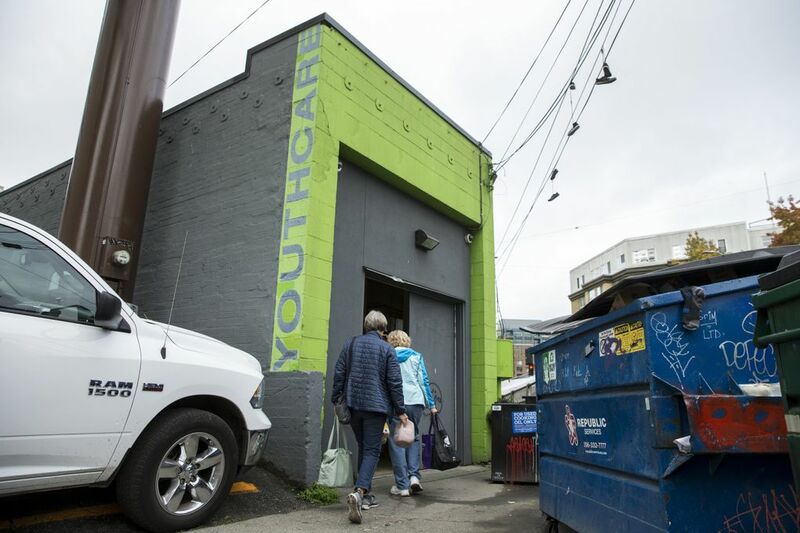 As the name indicates, youth are cared for — those who, at least for the moment, have nowhere else to go in a city that’s too often passing by those in need. And if you can hold a spoon, and have a few friends who can too, you could sign up to help one day rather than seething through another rush hour. The Orion Center is for youth age 12 to 24 who are experiencing homelessness. Sometimes — ideally, according to volunteer and community engagement specialist Craig Gibson — it’s just for one day. Outreach teams downtown offer help, or those on the street find out through word-of-mouth: There’s a safe and warm place, no questions asked, to hang out, store your stuff, charge your phone (or borrow one) and take a shower while you get your housing situation sorted out. For those with protracted circumstances, there’s free laundry, clothes, shoes, counseling, an on-site doctor, a teacher to help with a GED, a barista-training classroom in conjunction with FareStart, the possibility of a bed right now and help with a longer-term roof over your head. 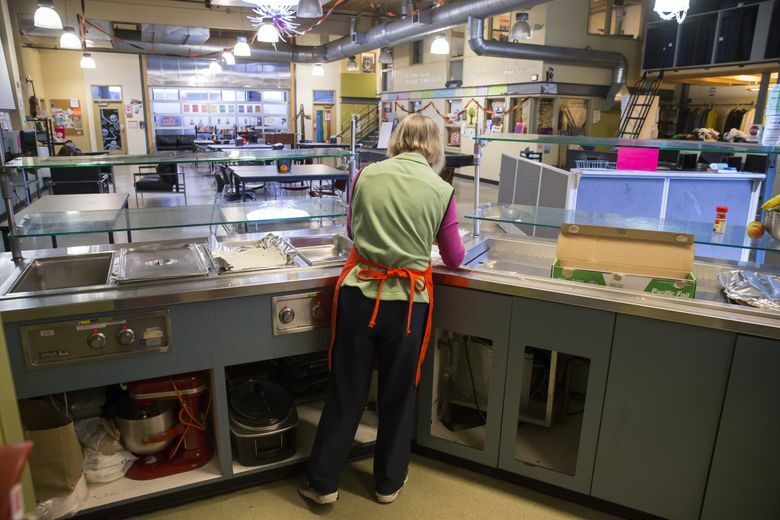 And the Orion Center serves free meals every day — 38,000 were made in its tidy, spacious restaurant-quality kitchen last year. 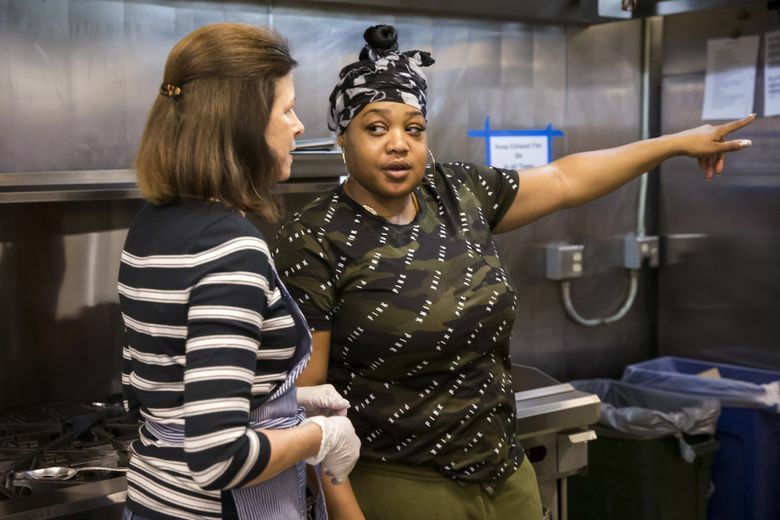 Providing hot, tasty food and a comfortable place to eat it is the first step, Gibson says, to earning the trust of young people who have not had many places in which to feel safe. 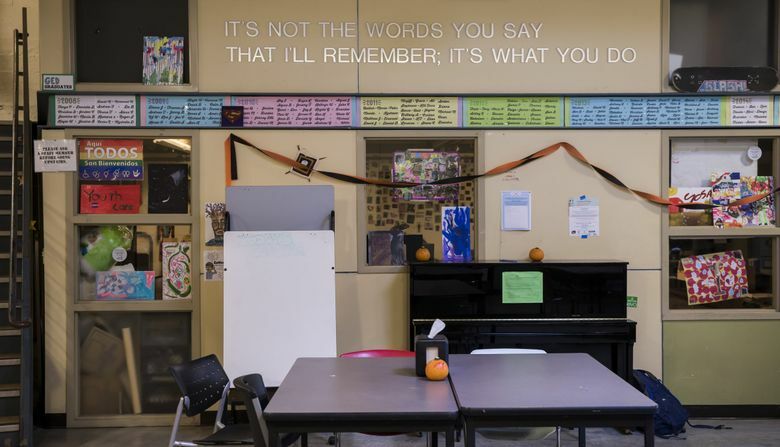 From there, they can begin to explore the other services YouthCare offers — “kind of a buffet,” according to Gibson, who notes that helping can be a years-long process. 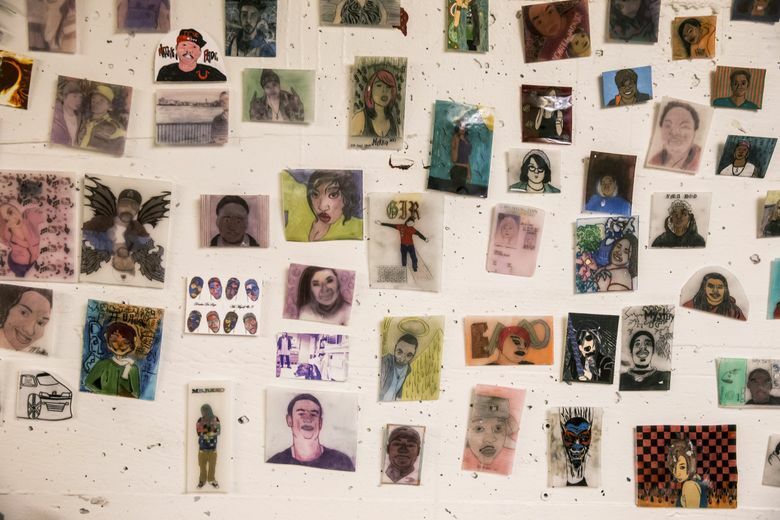 Three-fourths of the youth served are nonwhite, while one-third identify as queer; they may have suffered neglect or violence, been exploited and/or have mental-health or drug-dependency issues. 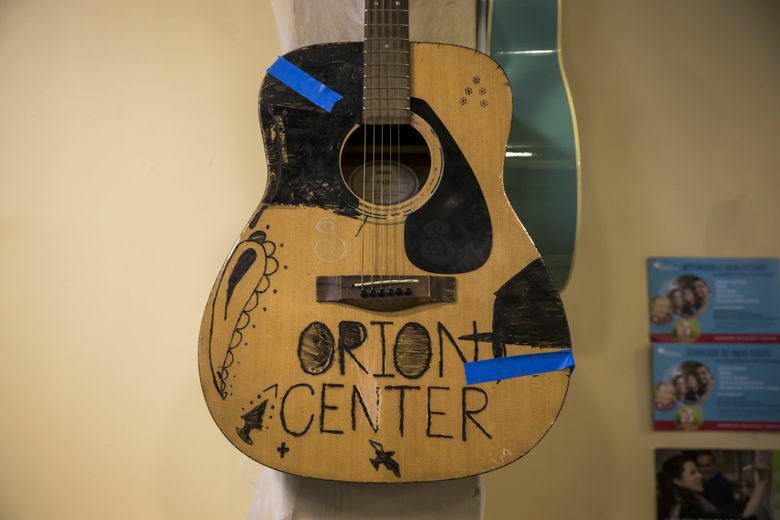 The Orion Center is there to meet them where they are. Gibson says he’ll never forget one young man who always ate standing up, holding his plate, until one Christmas-morning breakfast when he finally joined a table. Gibson wondered why. “I’ve learned I always have to be ready to run,” the young man said. Just to sit and eat is the start. 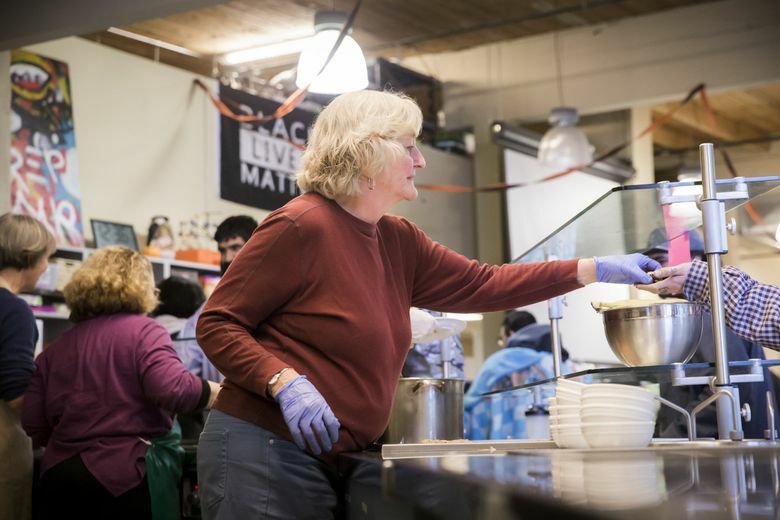 Orion Center lunch and dinner, available to any youth who comes, is made fresh on site every weekday by volunteers — all kinds of people kind enough to do so. Any group of three to eight can sign up online; on the schedule, you’ll find co-workers who’ve gotten together from Zillow, Boeing, the Bill & Melinda Gates Foundation; members of the Junior League; and mindful people of the Seattle Buddhist Church and of Temple Beth Am (Gibson lauds the latter for contributing dinners for decades). 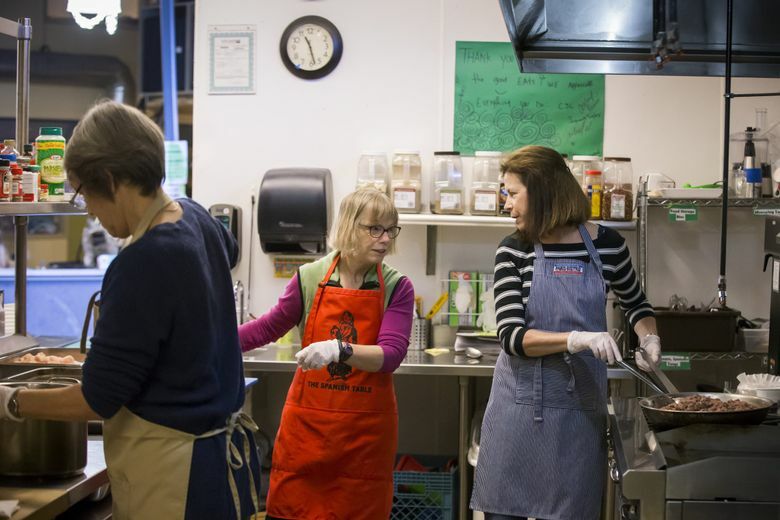 ONCE A MONTH, lunch is served by a group just calling itself NE Seattle Moms, who met when their children were in school together. The kids are all grown up and out of the house now — “My baby is 25!” says Jenny Guild — and the Moms have mom-energy and mom-skills to spare. “That’s what we love about this,” Guild says. 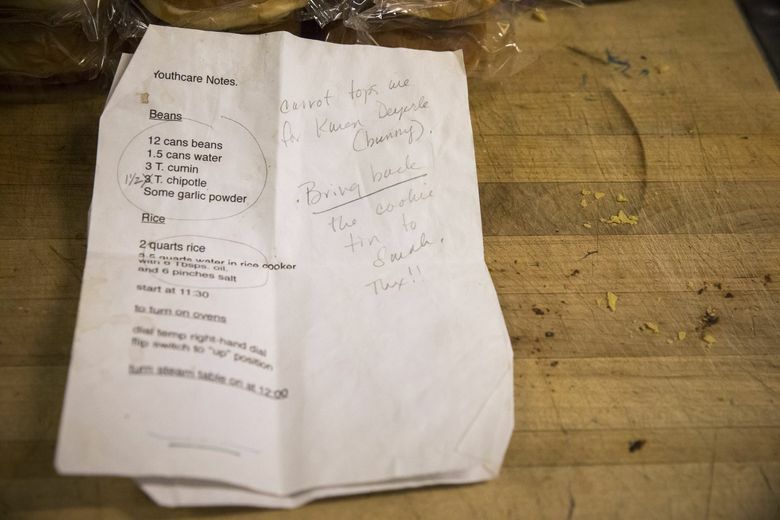 They’ve been coming to the Orion Center for six or seven years — no one can remember off the top of her head — and they make the same thing every time: barbecue-sauced chicken breast, ground beef, grilled peppers, a mix of black and refried beans, rice and tortillas for wrapping it up in, plus plenty of toppings and a side salad. 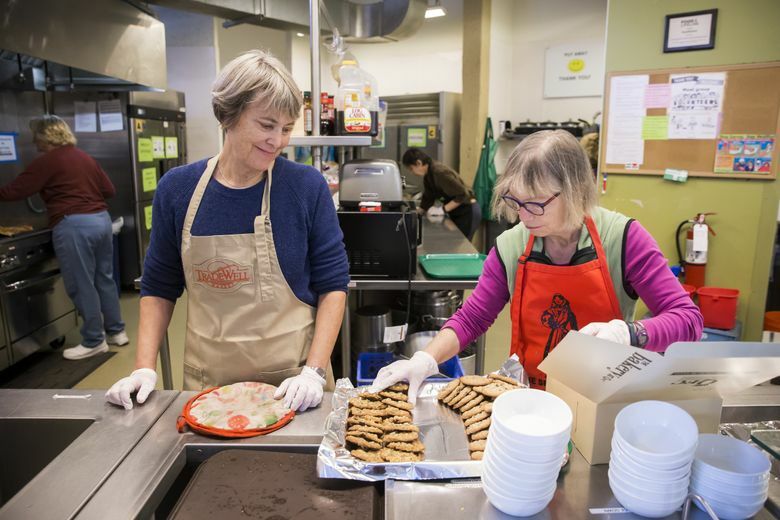 “The kids really like it,” says NE Seattle Mom Karen Smith, quickly unpacking supplies on a recent Monday at 11 a.m., “so we don’t really vary it.” Moms also know that dessert matters, so two of them always bring homemade cookies. Two cutting boards down, Cate Scott is dealing with a lot of onions. Coming here is heartwarming, she says. She likes serving the food, noting that the recipients are “so polite … One doesn’t have that impression of kids a lot these days!” She laughs. The chicken goes in the shiny new oven, an enviable heavy-duty, six-burner gas range with a flat-top griddle for the peppers. The Moms are impressed; the last one caught on fire after someone (not in their group!) left an oven mitt in it, but it wasn’t in such great shape. This one’ll be better for consistent use making food for 50 or so people, and more as it gets colder. It’s pretty quiet today at lunch at the Orion Center — the sound of happy eating, a little chatting. 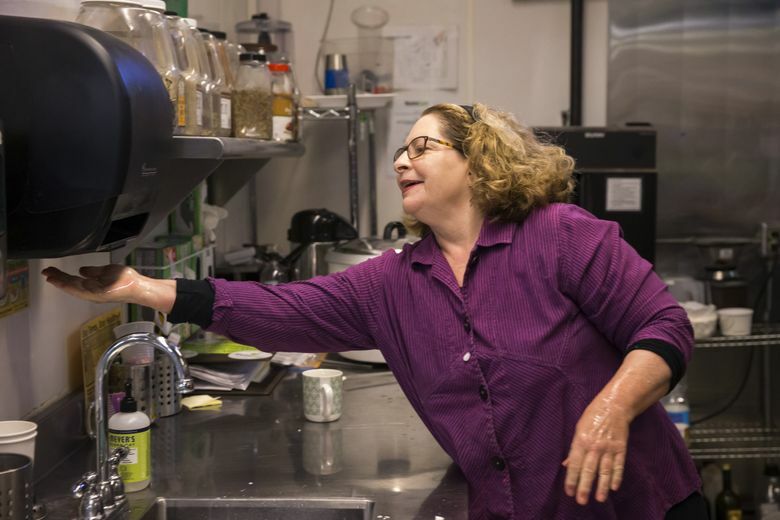 Some come back for seconds while others bus their own dishes, separating out the compost. The Moms get lots of thanks, lots of compliments. Today, there are hardly any leftovers. 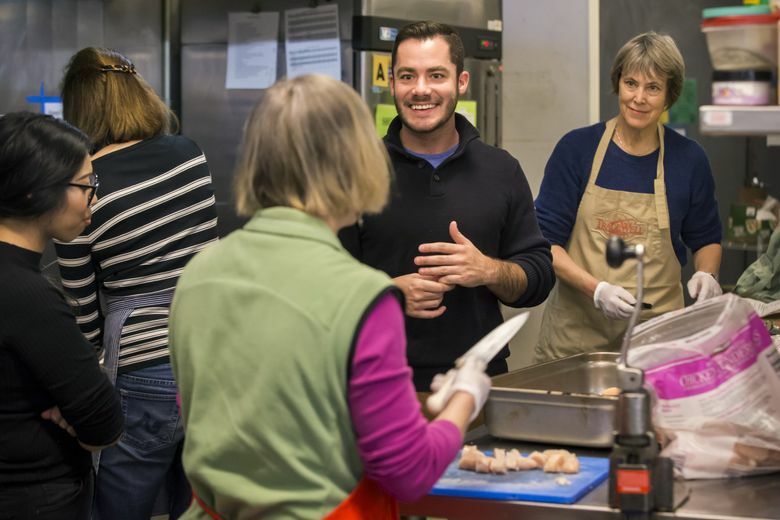 Volunteer: Groups of three to eight friends, co-workers or family (18 and older) can volunteer to make lunch or dinner at the Orion Center — the holidays tend to garner lots of help, but you can sign up now for the leaner early months of 2019. Individual and other group volunteers are needed as well, at the Orion Center and elsewhere at YouthCare. 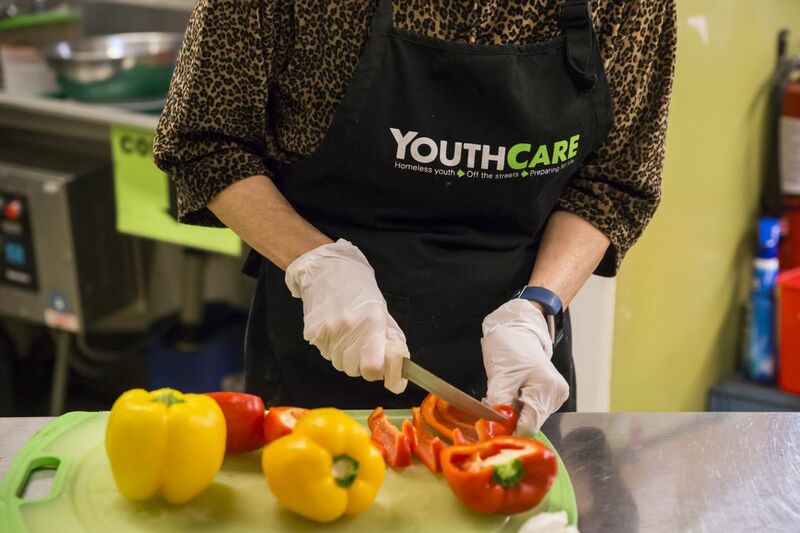 You can also email meals@youthcare.org (food-related questions) or volunteer@youthcare.org (general volunteering). Sponsor a meal: A $250 donation covers the cost of an Orion Center meal, and financial gifts of any amount are, of course, welcomed. Donate needed supplies: New or gently used kitchen equipment and nonperishable food items are welcome, as are pots, pans, dishes and other kitchen basics for youth getting set up in their first apartments.